Remnants of at least ten pyramids have been discovered on the coast of Peru, marking what could be a vast ceremonial site of an ancient, little-known culture. In January construction crews working in the province of Piura discovered several truncated pyramids and a large adobe platform. Officials from Peru’s National Institute of Culture (INC) were dispatched to inspect the discovery. Skull Fragments: The platform, measuring 82 feet (25 meters) by 98 feet (30 meters), was found alongside one of the larger pyramids in the complex. Another of the larger pyramids contained some artifacts as well as bone fragments from a human skull. The fact that the skull fragments were found several meters below the surface, indicating a deep grave that took much time to dig, prompted researchers to theorize that the individual buried there had high social status. This imposing monument has remained impervious to the ravages of time, and modern civilisation and stands surrounded by the asphalt jungle. The two-story construction is made of adobe with a steep ramp leading to the upper level. Archaeological excavations have unearthed mummies on display with ancient objects inside the on-site museum. Rumors of a vast hoard of gold prompted famous Norwegian scientist and explorer Thor Heyerdahl to investigate the area around Tucume in northern Peru. 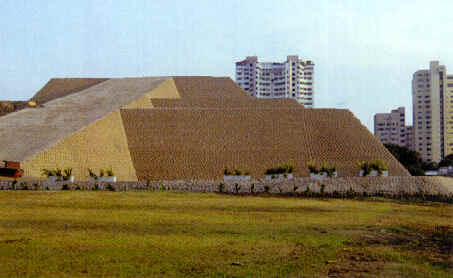 The result was the archaeological discovery of 26 pyramids. Forty tombs pre-dating the arrival of the Spaniards were opened, and enough Inca and Chimu artifacts unearthed to justify the building of a museum at Tucume. Four burial chambers in the 600 meter long Huaca Larga pyramid were excavated. Inside the burial chambers the bodies of 16 female weavers sacrificed to the gods. The area near Tucume consists of 26 massive pyramids which suggest a civilization that flourished in the now endless desert for perhaps more than 1,500 years. 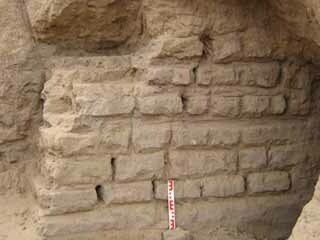 Ichimay Culture; had a Magic-Religious function of adobe brick. Theories about the Pyramids in Peru place their creation at the same time the Nazca Lines were created. 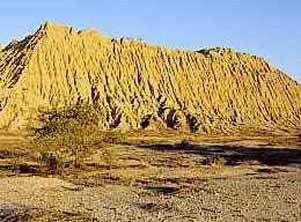 The pyramids had flat tops looking much like those in Mexico.